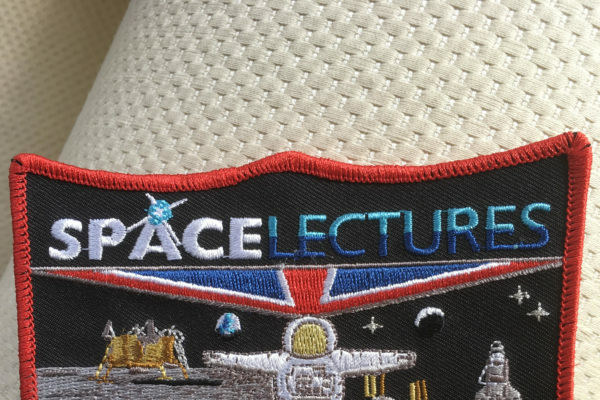 Space Lectures entrusted the creation of a patch to be designed by renowned artist Tim Gagnon, who is behind many of the Mission patches for NASA’s space shuttle program. His very first commission was as the mission patch artist for the Expedition 11 flight to the International Space Station — since then he has collaborated with artist Jorge Cartes and designed patches for Expeditions 22, 23, 25, 26, 27, 29, 30, 34, One Year, 47, and 48, and for the Space Shuttle program’s STS-126, STS-129, STS-132, and STS-133. He also helped collaborate with the crew of STS-135, the 135th and final mission of the American Space Shuttle program. On designing the patch for us, his inspiration … .. I had to make the astronaut as generic as possible. The left background is a nod to the past Mercury/Gemini & Apollo program to get us to the Moon. On the right the shuttle, ISS and as a nod to the future, I included the Moon. The result I think you will all agree is simply stunning! Thank you Tim for all your efforts in making this happen for us. Keep watching for our updates, we hope to bring you news of when it will go on sale very soon.